Peter Gago, oenologist and one of the five-person team responsible for Penfolds premium wines was in the UK recently to celebrate the new releases of the company’s top wines, including Yattarna, Grange, Bin 707 and the St Henri Shiraz. 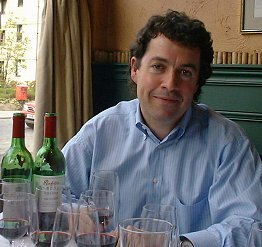 Before and during a good lunch in Edinburgh’s Ducks at Le Marche Noir restaurant, I tasted the wines with Peter who gave his own thoughts on the wines, and Penfolds position amongst the world’s great wine-making estates. This was a bit of a sneak preview, as the ’96 Grange was still a few days away from its official release in the UK.Although I’d tasted several of the trial bin” Chardonnays that Penfolds released as part of their freely-admitted attempt to create a “white Grange” flagship wine, this was my first tasting of the eventual product, Yattarna. The fruit is sourced from three states: the Snowy Mountains of New South Wales, the far south of Victoria and from plantings at altitude in South Australia. The 1998 is the fourth release. 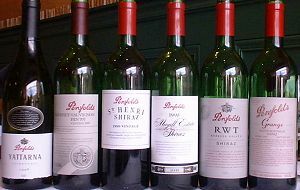 >The red wines at the upper end of Penfolds portfolio have always impressed me for their purity of fruit and density of texture, which is managed without the high-extract downside of bitter tannins. Peter explained that because their fruit is so carefully selected for its ripeness, they can extract enough flavour, colour and tannin from the skins (known as “phenolic compounds”) in the first four days of fermentation. After that, the juice is run-off from the skins and fermentation completes without futher skin contact. In other circumstances, to extract enough phenolics from less ripe grapes, the winemaker must keep the skins in contact throughout fermentation, and often leave them to soak post-fermentation too. This draws a different set of phenolics which are less ripe, less soft and less full. Largely because of this, top wines like Grange are approachable when very young, tend not to go through a “dumb” period like Bordeaux for example, yet can cellar for decades. To be honest, I would have to place all of these wines in the category of ‘very good indeed/excellent’: some may prefer other styles of wine but these are undeniably beautifully made and very satisfying wines. Interestingly, Peter served this at room temperature: the temperature he suggests, and how the wine is served to customers of Penfolds Magill restaurant back home. It has a medium gold colour and a fine, honeyed, warm toastiness on the nose with lots of hot-buttered toast and vanilla, peach and mellow, nutty fruit. There’s a nicely steely core of minerality that adds an edge to the aromatic profile. On the palate it has a luxurious and expansive mouthfeel, with fine weight and richness, developing custard and apple flavours and a lanolin texture and smoothness. Again, a nerve of minerality and good acidity runs through to the long finish, keeping this very well-balanced. Lots of people criticised the first Yattarna release as over-oaked, but I thought this carried the oak well and is a beautifully expressive Chardonnay. First released in 1957 under Max Schubert, the man who created Grange, this has a deep, vibrant, crimson/black colour. It has a high, eucalyptus-scented, mulberry richness of fruit with chocolate and blackcurrant nuances. Fine, dense mouthfeel and a rich seam of cherry-edged blackcurrant fruit. There’s a spicy note, but a bold fruitiness pushes through to the finish. This sees no new oak at all. A rare single estate wine from Penfolds (who generally believe in sourcing the best fruit from wherever they can find it), the Magill is made in old-fashioned basket presses which are said to produce softer juice, then is fermented in open tanks and aged in 100% new oak, so a very different beast from the St Henri. Quite savoury on the nose, the sense is of very tightly-focused black fruits, spice, pepper and a background of toast and cedar. On the palate the fruit and texture is velvety and deep, the character smooth, compact and muscular with a powerful richness. Full-bodied, the black fruit is tight and peppery but fine tannins lengthen and freshen the finish. The RWT is a much more recent invention, and is made from Barossa fruit from contracted growers, aged in 100% new French oak (Penfolds have seven full-time coopers who maintain and repair barrels, and sometimes manufacture them from imported, seasoned oak). This has a wonderfully deep, vibrant deep crimson colour. It is rich and warm with a spice-infused nose of clove and mint with dark berry fruit. Voluptuous on the palate, with thick, velvety berry and raspberry fruit and dense texture, the low-acid finish is long and rounded. Perhaps slightly less structured, but delicious and still well-balanced for cellaring. Extremely dark, deep black, only crimson at rim. Big, dusty blue/black fruited nose of blueberry and blackcurrant. Some spicy, toasted, charry oak but integrated already with a core of cassis. Medium to full bodied, the fruit is juicy and rich, rounded-out by velvetty tannins and lowish acidity, but these give a little grip and freshen the finish which is long, pure and cool. I have tasted every vintage of this wine since the 1989, and several older bottles too. Its quality and consistency are formidable, though to deny there are vintage variations would be crazy. If I was a betting man, I’d put money on this being a top-notch Grange. Fermented in 100% new American oak as always, this Grange is Shiraz, with around 6% Cabernet Sauvignon in the blend. It is dense and black, with a tight, glossy layering of fruit immediately apparent on the nose. Fantastically rich and sweet, black fruits are the main focus with a spicy, Dundee-cake richness underneath. On the palate it is chocolaty and very thick and dense, with a weight of dry, fruity flavour and crunch of sweet blackcurrant. Hints of chocolate, and the finish showing fine tannins and creamy, spicy oak against balanced acidity. Terrific purity of black fruits drive into a long finish. Very fine indeed.